PULASKI – Students at Lura M. Sharp Elementary School recently celebrated the meaning of respectfulness, the school’s Character Trait of the Month for October. Students at Lura M. Sharp recently learned the meaning of respect during a morning assembly. Students also celebrated Camo Day, which encouraged students to dress in camouflage. 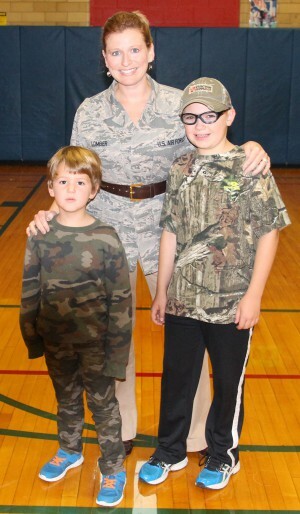 Pictured, principal Andrea Lomber and students Harrison McCullough (left) and Zachary Masuicca are all smiles while wearing camo. Students throughout the school gathered in the gymnasium for a morning program assembly, where students were afforded the opportunity to sing, learn and celebrate this month’s new character trait. Select students were handpicked from the audience to answer questions related to what constitutes being respectful or not. The assembly also coincided with the school’s Camo Day celebration, which encouraged students to wear camouflaged clothing to help promote comradery among the students.